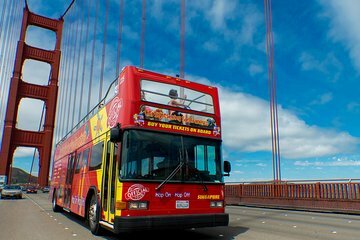 Passeie de ônibus em São Francisco e seus arredores em um ônibus hop-on hop-off com um passe City Sightseeing San Francisco. Selecione um passe de 1 dia que inclua acesso aos passeios pela cidade e por Sausalito. Ou escolha um passe de 2 dias que inclua os passeios City e Sausalito, mas acrescente uma rota para o parque e a praia, e o passeio noturno também para cobrir todas as principais atrações com um único ingresso. Este passe flexível e familiar permite que você entre e saia do ônibus de dois andares em qualquer uma das paradas designadas e explore São Francisco no seu próprio ritmo. O passe de 48 horas inclui um passeio de parque e praia e passeio noturno. Quando você está com pouco tempo e muito terreno para percorrer, os pontos turísticos de São Francisco são fáceis com o ônibus de dois andares. Este tour panorâmico pela cidade inclui pontos turísticos, museus, restaurantes, bairros e muito mais. Use o seu bilhete de ônibus flexível de 1 ou 2 dias para apreciar a vista panorâmica da Baía de São Francisco e explorar em seu próprio ritmo. Selecione um passe de 1 dia que inclua o City Tour Oficial e Sausalito Tours com o uso ilimitado do hop-on hop-off. Ou escolha o passe de 2 dias, que também inclui um passeio de Park and Beach, incluindo Lands End e Ocean Beach, e o Night Tour do centro de San Francisco. 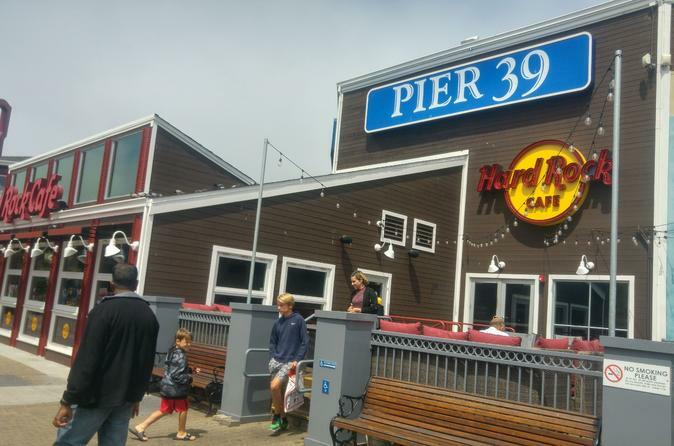 As excursões partem do Fisherman's Wharf, mas você pode participar em qualquer parada ao longo da rota. Conheça a Chinatown, o Pier 39 e o Ferry Building na Rota do Centro; explore a Ponte Golden Gate, o Parque Golden Gate, Haight Ashbury e o Centro Cívico na Rota Oficial da Cidade. Atravesse a Ponte Golden Gate e desfrute da encantadora cidade de Sausalito no Sausalito Tour. O loop contínuo no Night Tour é uma maneira ideal de ver as luzes cintilantes de São Francisco à noite, com vistas do topo de Nob Hill, Chinatown, North Beach e Embarcadero. The web site has pics of City Sightseeing bus but it isn't touring. It is Big Bus. Not good, not honest. This is a great value for the money and a great way to see all the sites and hear some of the history. We did a 2 day pass, plus the night tour, and the night tour was spectacular! It fills up early line up by 6:45/7 to be sure to get a seat but it was so beautiful. We had wanted to stop during our daytime tour at the Palace of Fine Arts but ran out of time, and it ended up being a blessing since seeing it lit up was magical! The bus stops at all the major attractions, and overall runs pretty smoothly and on time. There's an app that tracks the buses so you can see how long you'll wait, but I am convinced that it all just made up since we ended up waiting 20-25 minutes at some stops when the app showed the bus was right there! In all, though, for the money, this is a perfect way to see the city without renting a car and dealing with the craziness of city driving. Our only criticism is that when our bus broke down in Union Square, there was one staff member to tell us to get on another bus that was full but we crammed in the bottom, and the tour guide just disappeared and made no announcement whatsoever. He just bailed, and we only knew to get off the bus because the people from the front heard the driver say so. In the madness of Union Square with traffic and tons of people, we really had zero guidance at all and this wasn't safe at all. Things happen, but this was handled really poorly. Needless to say, that guide got no tip! Overall, though, this is a fun and easy way to see all the highlights of the city. We'd highly recommend it. I printed my voucher as instructed. I waited for the bus at one of the stops marked on the map there are no signs at the stops as I expected... as a tourist, that would help. I was there at least 30 min and never saw a bus at all, and then when I saw one, it was on the next street over and didn't stop. I waited until one finally came, and showed the driver my voucher. He almost didn't let me on the bus, because he said I had to go to the office to get an actual ticket. Luckily, he let me on the bus to take me there it was the next stop. I get my ticket and go back to the stop to wait on the next bus. Eventually someone with the company asked me if I was waiting on the bus and apologized that he had someone go home sick and they couldn't find a replacement. I ended up walking up to Ghiradelli Square to kill some time before the last bus came. I didn't realize that it wasn't for the Hop On tour, it was the lights tour. There weren't a lot of Christmas/Holiday lights to be seen really. I appreciated some of the commentary, but most of it was ridiculous. There were kids on the bus, so yelling, Let's smoke some dope or similar as we drove under the tunnel was a bit unnecessary. I would not do the holiday lights tour again. I may try the Hop On/Off tour but only if I went first thing in the morning so I could actually catch the first bus to guarantee I could use it. I spent too much money on this to get what little I got. There was little coordination of busses red and blu: by the office. The guides didnt know until the last minute which route they had, and resulted in moving passengers off and on the busses and standing in long lines waiting for a bus. This was not the best Hop on Hop off tour I have taken. Visits to Edinburgh, York and Windsor this year were much better. The staff were disorganized, buses were late or failed to connect resulting in long waits. The Sausalito sector one day was only running one bus so we had to wait an hour. Staff sickness/shortage resulted in sub par performance. The published time table is not reliable. It was not cheap either. Some of the guides were excellent with a good knowledge of their subject. This hop on hop off was really good. BB and CoCo were really great and made the tour fun and informative. My only complaint is with Viator that on my voucher it said to redeem it on Fishermen's Warf at the tourist center. I couldn't find it, and when I asked someone they said there was no such place and to go to City Sightseeing's office on Columbus. To me that should have been made clear on the voucher instead of us walking all over the place for 20 minutes.